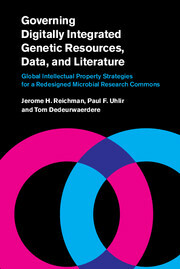 Professor Reichman's latest book, Governing Digitally Integrated Genetic Resources, Data, and Literature published in October 2016, examines problems that scientists face when seeking access to genetic resources originating in other countries for research and development. It focuses on both plant and microbial resources for these purposes. For read only link to the entire volume, see co-author Paul Uhlir's website.